I have been using the i-MiEV for the last 9 months for daily commute plus running errands averaging about 50 miles per day. 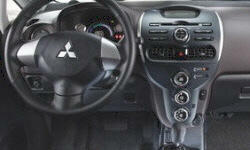 Why the 2012 Mitsubishi i-MiEV? I have owned this car since June 1, 2013. Here is my 9-month review. 1. Has enough range for my commute and after work errands I need to do. I have had to use my wife's gas car once in the last 9 months, because I thought i would not have enough range for a trip I was planning after work. I use it an average of 50 miles per day, if I need to use it more I plug it in at work into a regular 120V socket. I also plug it in during the day when it is below about 10 F due to heater use. 2. Charges fast enough - not sure why so many people are obsessed with charging speed. I plug it in when I get home in the evening and the car is always fully charged by morning. I don't care if it takes 12 minutes or 12 hours, as long as it is full by morning. (for overnight charging I use a 12A 120V EVSE from a regular outdoor household socket) 3. Quick enough to keep up with any city traffic, merge on highways, etc. Has a lot of interior room for the exterior size. It has more than enough legroom for my 12-13 year old kids. Has a lot of interior room for the exterior size. Cargo space is very functional and the rear seats fold completely flat making it easy to carry large items. Super cheap to run - maintenance free so far, and power costs are about 85% less than what I used to spend on fuel for my previous car. Using the heater will increase power consumption drastically - as much as double compared to mild weather. Still a lot cheaper than paying for gas though. Dash rattles when you hit broken pavement, suspension is quite harsh for our nasty potholed roads. 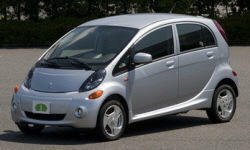 Why Not the 2012 Mitsubishi i-MiEV? A full list of gas stations appears on the GPS but no charging stations!!! I am 5'11" and I need to have the seat fully back to be comfortable. Not suitable for persosns over 6' tall. Some interior trim pieces look cheap and feel like they will not hold up well over time. Bluetooth phone connection easy to set up and sound quality very good. Excellent after 9 months of daily use, no issues at all.